TouchOffice Web gives you a bird’s eye view of your business. 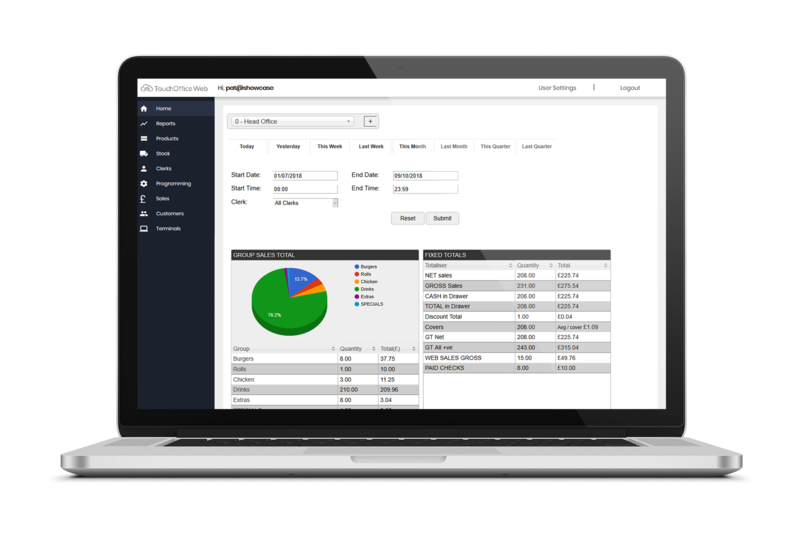 TouchOffice Web is a powerful management tool that provides you with a complete real-time understanding of your business on any web-enabled device, from anywhere in the world. Make those big decisions with ease by accessing historical sales reports to enable you to forecast pricing, stock and manage staff rotas. The software is versatile enough to be used by businesses in any sector from retail to hospitality, from the smallest independent shops to multiple-site restaurants. Keep an eye on day-to-day activity with real-time sales information. Monitor and detect fraud by combining clerk audit trail with compatible CCTV systems. Stay in control with a stock control system and use handheld TouchStock devices to perform stock takes, create supplier orders or branch transfers and schedule deliveries. Manage staff with Time & Attendance reports. Remotely make programming changes to EPoS systems online from anywhere, at a single site or globally over multiple sites.